A total of 25 Commando Merlin aircraft will be delivered to the Royal Marines Commando Helicopter Force (CHF) who will use them to deliver troops and supplies from sea to land. 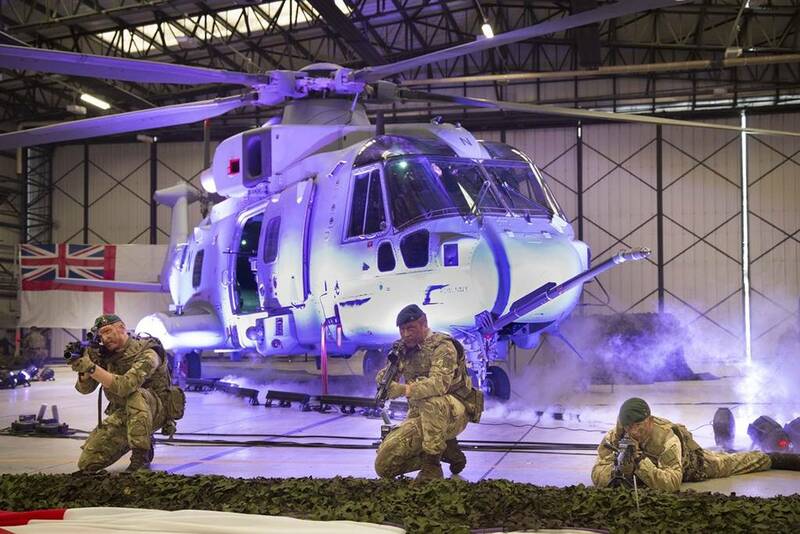 The new Royal Marines Commando Merlin Mk4 helicopter is unveiled at RNAS Yovilton. 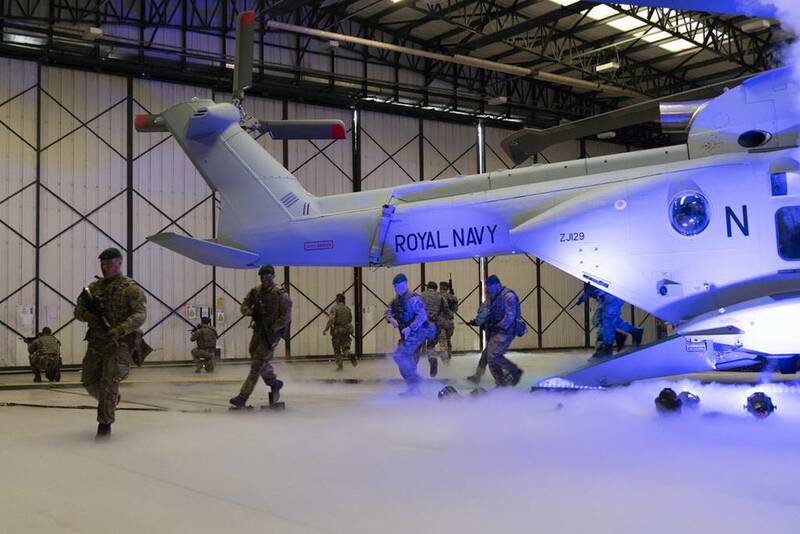 May 25, 2018 - Guto Bebb MP, Minister for Defence Procurement, announced the delivery of the first AW101 Commando Merlin Mk4 helicopter during a ceremony held at Royal Naval Air Station Yeovilton yesterday. 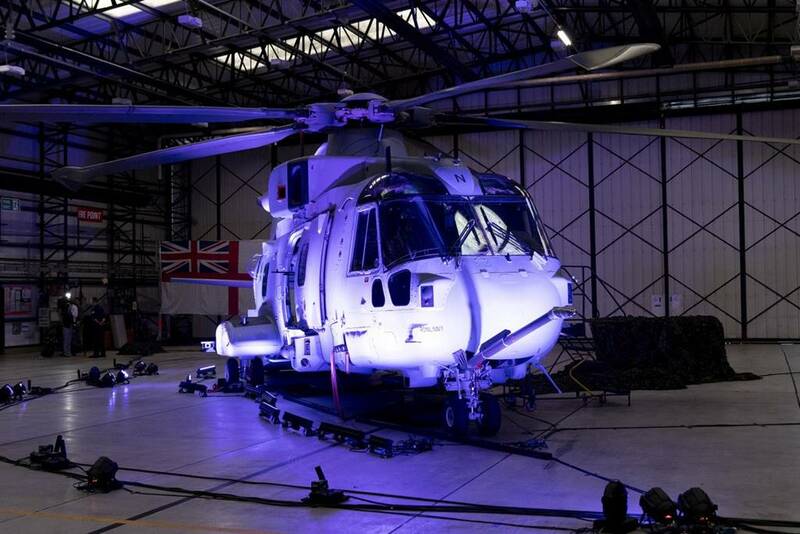 The event marks a major milestone for Leonardo’s Merlin Life Sustainment Programme (MLSP) contract to convert 25 former Royal Air Force Merlin helicopters to fully marinised amphibious support Commando Merlin helicopters for use by the UK’s Commando Helicopter Force. The Commando Merlin Mk4/4A helicopters are fully optimised for ship operations and include automatic main rotor blade folding and tail fold, an uprated undercarriage and enhanced cabin safety features. The aircraft are also fitted with the same advanced technology cockpit developed by Leonardo for the Royal Navy’s Merlin Mk2 aircraft, giving the UK’s Merlin fleet a common cockpit featuring five 10” x 8” integrated display units, two touch screen units for controlling the aircraft’s systems and mission equipment, as well as two cursor control devices to control the tactical displays. 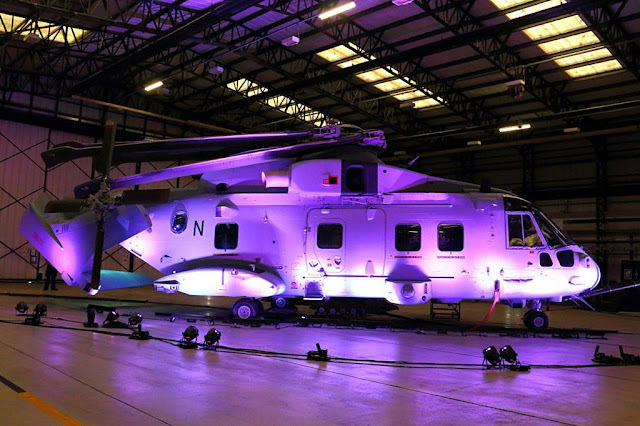 Leonardo’s electronic warfare experts in Luton have also upgraded the self-protection system on the new Commando Merlin aircraft to provide optimum security. The previously-federated Defensive Aids System (DAS) has been integrated with a latest-generation DAS Controller, which allows the system to rapidly identify hostile weapon systems and initiate appropriate tactics and countermeasures. By introducing a level of automation and integrating DAS functionality with the helicopters’ new cockpit display units, pilot workload is reduced. Leonardoalready provides defensive aid suites across the UK Armed Forces’ helicopter fleet and provides Electronic Warfare Operational Support (EWOS) for all of these platforms, allowing the fleet’s protective systems to be re-programmed in response to changing battlefield conditions. Leonardo has also been contracted to deliver a range of Commando Merlin synthetic training devices comprising two Flight Training Devices (FTDs), a Flight Navigation Procedures Trainer (FNPT) and a Rear Crew Trainer (RCT). These will be delivered during 2018 and 2019 and installed in the dedicated Commando Helicopter Force training facility located at the aircraft’s main operating base - RNAS Yeovilton. The training devices will enable multi-aircraft and whole crew training, utilising augmented reality to enhance the training experience for the rear crew.